Lately I've noticed a lot of anxiety and stress around me. Maybe it's the economy, or the self-inflicted wasteland of cable news, or even the recent alignment of the moon, earth and sun. I don't know. But it does feel like a lot of crazy out there, and with it a shortage of civil behavior. It seems like the speed at which people go from nothing to inflamed response is getting faster and faster. The bottom line I see is just a lot of worry, anger and expressed frustration. Calm, non-engagement is a good thing. But how do we get there? Is there a secret? A young friend in India gives a clue. Recently he was in an open jeep with no doors, off-road driving with his uncle at his home. 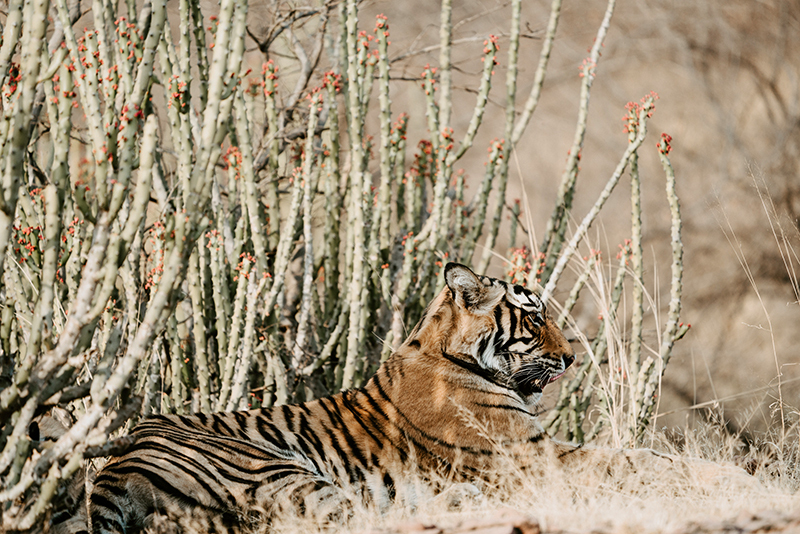 The land bordered the Ranthambore tiger reserve, one of the few sites in the world where tigers remain in the wild. As they pulled up to a watering hole, suddenly a large Bengal male appeared, walked up and stood next to the jeep. The tiger calmly came to a stop beside my friend. Two feet away, in an open and door-less jeep, now stood the towering Bengal. Wise advice. When taming our own tigers, the first step is always the most important. Stop talking. Little good rarely comes from our mouths when the mind is engaged in fear or negative emotion. When our inner tigers are closest, we are in a place of emotional unreliability and not at our best. The potential for attracting more trouble goes up exponentially the more we speak. The course through is what the Japanese call "noble silence". It's simple, direct and the most successful strategy for moments of inner turmoil.